Vince Eager's own excellent web site is the best source of information about our very good friend. An essential buy for any collection is Vince's retrospective CD, Yea! Yea! It's Vince Eager. Many who are familiar with Vince's work have long regretted that his talent, versatility and sheer energy have rarely earned him the level of attention and appreciation that he so richly deserves. Those of us who were fortunate enough to see him in action with Rockola at Fury Fest left with our admiration for this superb entertainer reinforced. The 25 tracks on this excellent CD illustrate Vince's strengths, with a variety of songs covering his 45 years in show business, from the privately-produced tracks of the late 1950s, through the Elvis era, to the astounding No Other Baby of the 21st Century. This CD, which comes with a 28-page lavishly-illustrated booklet is a masterpiece. It features the regular Rockola line-up of Vince, Simon, Christie and Karen Taylor, and drummer Martin "Fred" Featherstone. 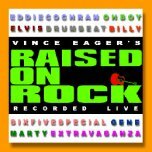 Vince issued a live CD from his 2001 Raised On Rock tour with Big Jim Sullivan tour performances, and Real Audio files of Maybe Tomorrow and Halfway To Paradise will be found on Paradise Place. 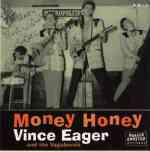 The CD is an excellent £10-worth and demonstrates why Vince has been pulling the crowds for more than 40 years. It also features Eddie Cochran and some very big Elvis numbers, climaxing in American Trilogy and Suspicious Minds. Vince was once Billy's flatmate, and during the tour, he told a few tales of their times together. I'm sure Vince will not mind if I quote one passage from an e-mail to me, in which he says: "Billy was a very dear friend and colleague in those early years. He was someone I admired tremendously as both an artist and a human being." 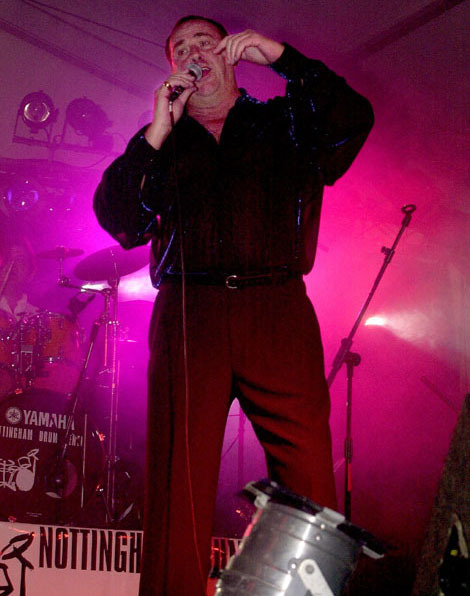 I saw Vince performing at an outdoor event at Lincoln in summer 2000. His talent has matured and grown, and he has a dynamic stage presence. The Raised On Rock tour is not to be missed, and I hope we're going to see a lot more of one of the authentic rock and rollers in the years to come.. I recommend you to spend some time on his web site as well. It's a fascinating, literate presentation. Vince is pictured above in action near his home in Radcliffe, Notts, in 2000. I've also acquired a 7 inch vinyl EP, published in 2000, of the first four tracks recorded by Vince (then still Roy Taylor) and the Vagabonds in 1958. The group comprised bassist Roy Locking (who later replaced Jet Harris in The Shadows), Roy Clark on guitar and drummer Mickey Fretwell. The tracks for the EP were recorded in a small studio over the HMV record store in Oxford Street, London. The two-hour session cost them £8 - over £100 in today's money. 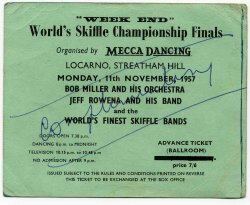 The money was their winnings from finishing second in the World Skiffle Championships! About 50 copies of a privately-pressed single of two of the tracks, Be Bop A Lula and Money Honey, were sold for 4s 6d each in Grantham. This EP, digitally remastered from the original acetates and produced by Roller Coast Records (RCEP 132) adds My Dixie Darling and Cotton Fields. It arrived in the post at my home on a Friday afternoon, and I put it on the turntable to give it a cursory first listen while I was packing to go away. Money Honey stopped me in my tracks and Be Bop A Lula just knocked me back. The raw energy in Vince's voice is overwhelming. I have to tell you that my copy of this EP was played only once more - when I copied it to a CD prior to putting it safely away. I honestly consider Money Honey as one of the best tracks by any British rock performer that I have heard from that era. The EP is available for only £5. To order either or both, send a cheque to VIP, 4 Cherry Tree Close, Radcliffe, Nottingham, NG12 2GE. Vince has since become a friend to many of us as a supporter of billyfury.com and headlined at Fury Fest 03. 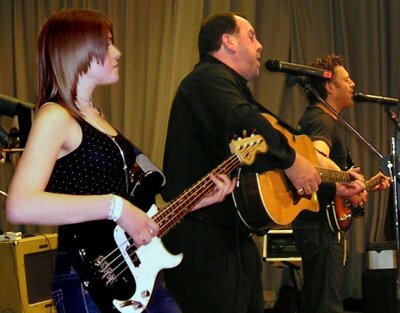 In March 2006, a third generation of Vince's family, 15-year-old granddaughter Charlotte stepped into the limelight when she played bass with Rock-Ola in London. stage at an all-star gig in London. What no one in the audience of rock veterans knew was that it was her first gig playing guitar. had turned 15 just days earlier. The gig was a 400-capacity sell-out. who is the band's bass player, couldn't make it. "I was going to get someone else, but then it was suggested that Charlotte could do it. 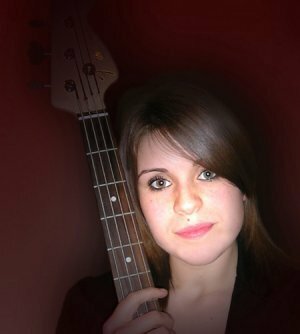 Although she is an accomplished clarinettist, she had only been playing the guitar a matter of weeks, but I thought why not?" Charlotte wasn't so sure. "I didn't want to do it at first, but then I thought it would be fun so I said yes. It was a bit of a shock to see all these people from famous bands - I was a bit starstruck. "But I also dance so I am used to performing." Doting grandad Vince said: "I was over the moon, it was fantastic to have three generations on stage. There were a lot of rock luminaries there: Rick Parfitt from Status Quo, Mick Avory from the Kinks, a couple of The Tremeloes. Everyone commented on how well she had done." Vince and Charlotte, whose ambition is to be a journalist, are hoping for a repeat family performance with Rockola in the future. But Vince added: "I don't think I'll sack my son to use my granddaughter ... although she is better looking."